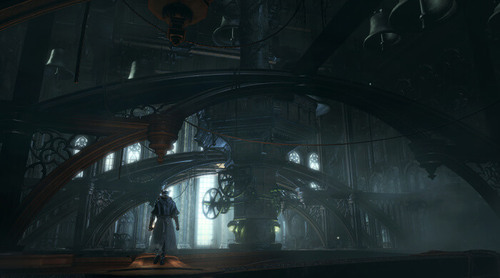 The NPCs encountered here are: Harrowed Hunter at the elevator leading to the Research Hall, and Saint Adeline in on the first floor of the Research Hall. Two powerful enemies roam the area: Living Failures and Lady Maria of the Astral Clocktower. Presumably where the Healing Church conducted experiments on humans in an attempt to create beings capable of communication with the great ones. Many of the enemies in the area are the failed results of these early experiments, although the Healing Church would eventually find success in this endeavour, creating the Celestial Emissary. The presence of a Lumenflower garden similar to that found in the Upper Cathedral Ward (location of the Celestial Emissary) suggests that this secret research facility was at one time a part of the same complex. An enlarged head of a patient of the Cathedral, with a cavity that just happens to fit a human head, although one would be mad to try it on. But if you do, listen carefully, for the sticky sound. Drip, drop. As water, seeping up from the depths, slowly, steadily. Originally used to safeguard the leader presiding over a sacred Healing Church ceremony, and later supplied to tomb prospectors, in particular those exploring the labyrinth of Isz. The blue is fashioned after a lake, and the shield greatly reduces all forms of non-physical damage. Key to the balcony on the first floor of the Research Hall. Lady Maria of the Astral Clocktower gave this to the patient, Adeline. Maria had hoped Adeline would find comfort in the faint breeze that carried the scent of flowers from the outside, but Adeline couldn't fathom her intentions. Hunters are held within the underground cell, so that things better left unseen, better left unknown, will decay quietly in the fallow darkness.